I am planning an overnight hike soon and it is pretty cold in Southeast PA. 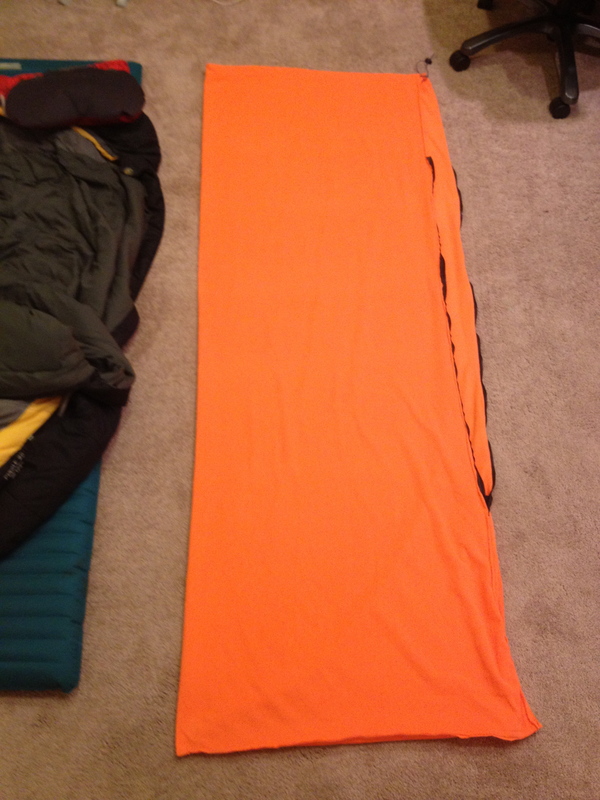 I decided to make my own sleeping bag liner to help me not die. A little research brought me to this article. I mentioned the project on the Facebook Page for Brian’s Backpacking Blog, and Brian asked me for some details, so I decided to write it up for him, his readers, and for all of you. I did follow the recommendation in the article and bought micro fleece. 1) My fabric was 58″ wide. I experimented before starting by folding the fabric in half and laying the resulting long rectangle on the floor. I laid my sleeping bag on top to get an idea of how much “extra” material there would be if I did not trim the foot end to more closely match the dimensions of my mummy bag. I also got inside the fabric to see how it felt. I folded the foot end a little and folded the open side a little to mimic space “lost” in the hemming/sewing phase. Everything seemed fine to me and I decided not to cut open the natural seam made by folding the material length-wise, nor did I cut the end section down to create that tapered look/reduce weight/increase the warmth factor by removing “dead space”. 2) I bought 7 feet of fabric instead of 2 meters. I was not sure what I would do at the top, but wanted to have enough fabric to mess about with a hood of some kind. And at 6 feet tall, I was not sure that 6 ½ linear feet of fabric would leave enough to cover my head once my body was involved, messing up that distance with its 3 dimensions and all. 3) I did not baste stitch the whole length of the fabric on the seam-side before installing the zipper. This seemed like extra work that would have to be undone, for little gain. I am sure they have their reasons, and I bet that their liners look much nicer than mine, but it worked just fine for me to only do the basting stitches for the exact area where the zipper would be installed. 4*) I am not sure if this is different or not. Perhaps because, while I can and do sew, I know very little about it or sewing-specific terminology. I was not very clear on what they were talking about with the “right side”. I could not tell if they meant the side with the pattern that they wanted to face out at the end, or the side that they wanted to have next to their skin when all was finished. I was building mine for comfort, so I determined which side I wanted next to my skin and did the project so that all the seams and the zipper fabric would be on the outside of the liner and I would have a smooth unobstructed liner inside against my skin. I wanted to be able to close the top somehow and decided to install a little tunnel for a drawstring. Micro fleece is not the strongest material out there, so first I made about a ½ inch fold and ran a seam along the top edge of the material. Then I folded the same area again, about 1 inch this time and ran another seam. This is when I thanked the Lords of Kobol that I did not cut the opposite side lengthwise. It turns out micro fleece is really difficult to sew! You can do it – I did. But it is trickier than cotton/poly/blends or any other fabrics I have worked with in the past. It really wants to “wander”, bunch, or have the upper and lower sections pass through the machine at different rates. You can combat this by going slowly and careful hand placement/fabric feeding. I laid the fabric out full length and folded in half on the floor again and measured 12 inches from the top and put in a straight pin to mark this as the upper terminus for the zipper. I set the zipper aside and put straight pins in every 4 inches or so until placing the final pin at the lower terminus of the zipper. I used a basting stitch (the longest distance between stitches that one’s machine can make) to put in a temporary seam along the section I just pinned together corresponding to the length of the zipper. 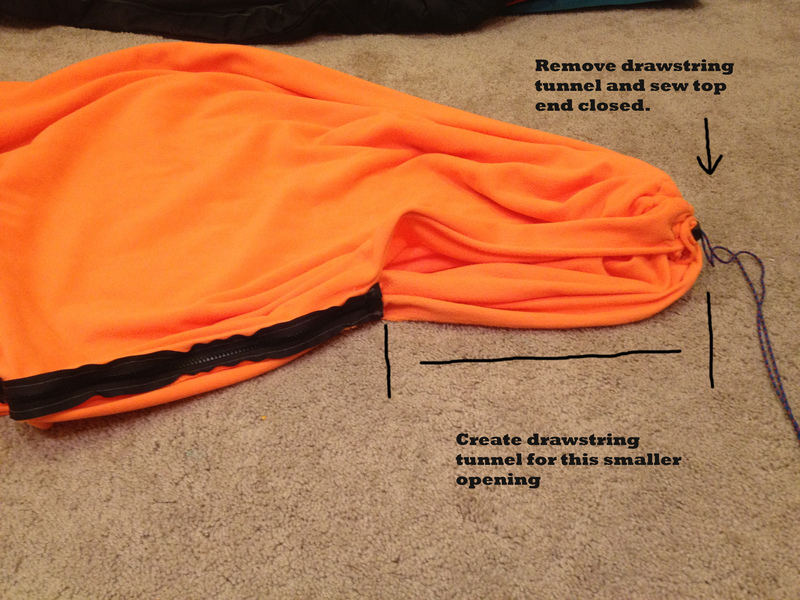 Consider your seam allowances and leave enough room to attach the zipper. Note – do not lock in this seam at either end with the customary reversal stitching, that just makes it harder to take these stitches out later. I did it out of habit and had extra seam ripping to do. Butterfly open the new seam and pin one side of the zipper to one of the newly created “wings”. This is the most important moment to think about which side of the bag you want to be in and which side you want the zipper to be on – which way the zipper moves and whether or not you want to be able to operate the zipper pull tab from inside or outside of your bag liner. I bought a 42 inch coat/parka zipper that has a pull on each end so I could not mess that part up. It did take a little visualization to make sure that I would be able to access the zipper pull from inside the bag liner. Remember to change your sewing machine settings from a basting stitch to a more normal setting. I went with something in the middle of the range offered by my machine. Sew the zipper side you just pinned. It was only tricky at the two ends where the bulge from the zipper pull fought against the sewing machine foot. I did (eventually) figure out how to move the zipper pull out the way, sew a little, then move the pull again. You do want to do the reversal lock stitch thingy at each end of the zipper seam. Repeat the pinning and sewing for the other side of the zipper. Lay the material out flat on the floor again and from the bottom of the zipper, throw some pins in the fabric down to the foot and then across the foot end and sew it up. Feed a drawstring through the tunnel you made at the top. I used some 2 mm para cord and an extra spring clip I had in my extra gear bag. 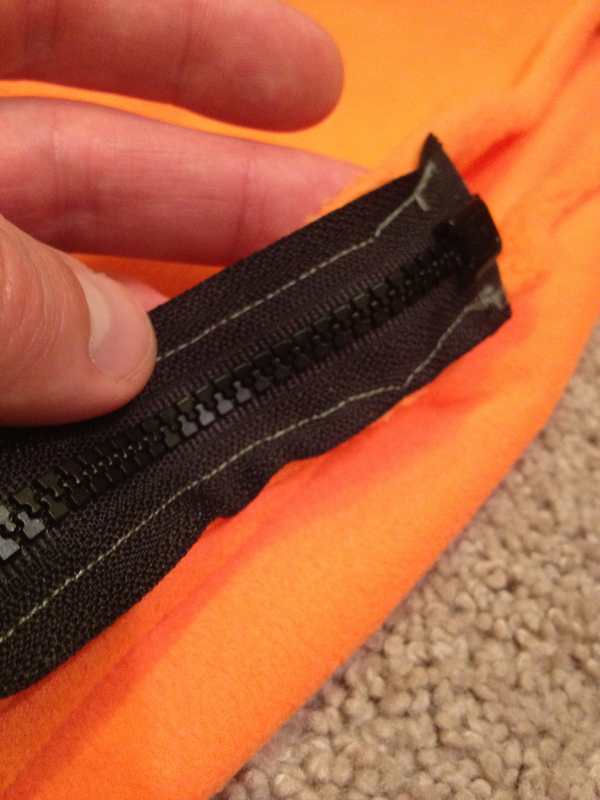 Turn it inside out and remove the basting stitches from the zipper area. Turn it inside in, pull down the zipper and get in that sucker to see how you did! That is where I am at with it now. It turns out that the 12” allowance I made above the zipper provides plenty of space for ventilation, so I have planned a further adjustment. I am going to bust out my trusty seam ripper and undo all the stitching for the drawstring. Then I am going to lay down in the liner and determine if I will need to keep all 7 feet of material or if there is any room to trim further. 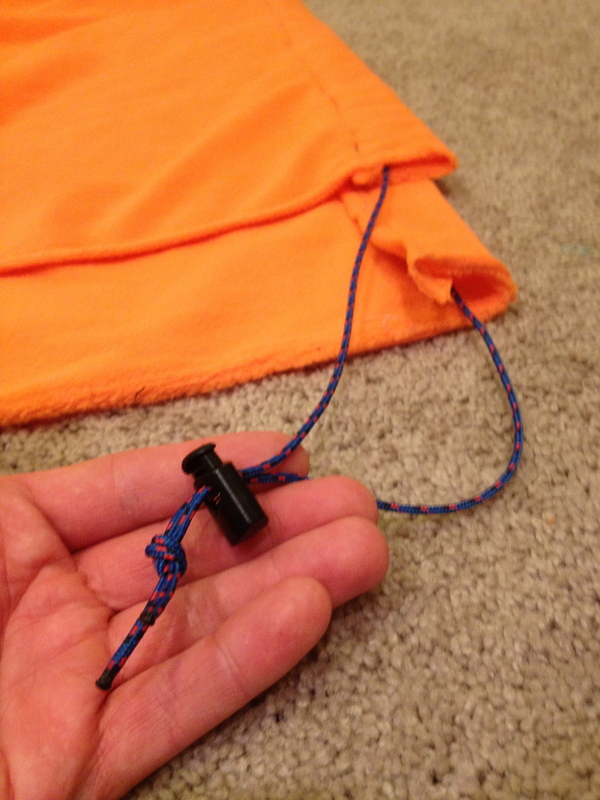 Then I am going to follow the same procedure used to create the original drawstring tunnel – but do it along the short section above the zipper (see photo) and pre-install the drawstring before stitching the top end closed. I will let you know how that works once I get around to it. For now, the liner works great as-is. If you are really ounce conscious, you may think it is worth it to trim off as much unnecessary material as possible. That is a great idea. If you do not have much proficiency at the sewing machine, or in working with micro fleece, I would recommend that you try the whole procedure first with an easier material – like an old bed sheet – to work out all the kinks before moving to micro fleece. Hold up. You are 3-D?! I thought you lived inside the interphones?